A loyal dog which has waited on a busy road for more than 80 days after its owner died there has captured the hearts of online communities in China. Footage of the animal in the middle of the road in Hohhot, Inner Mongolia, has been viewed 1.4 million times on the popular Sina Weibo microblog. China's Pear Video website said the dog has been seen in the road every day since its owner died on 21 August. A taxi driver said people try to help but the dog runs away. The video was filmed on 10 November and since it was shared on Sina Weibo, the site used instead of Twitter or Facebook in China, users have been commenting on the "loyalty" of the dog. One person said: "This little dog is so loyal. My family used to have a dog and every day it would wait for me by the village school." Another user was concerned for the welfare of the pet. "It is so dangerous for that doggy to stand in the middle of the road. I hope that some good people can adopt it and take it to a safe place," they said. But this is not the first devoted dog to tug on the heartstrings of those on China's social platforms. 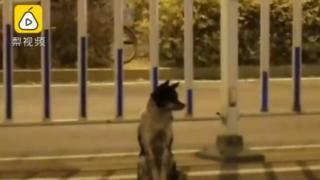 Earlier this year, Pear Video users fell hard for an elderly dog named Xiongxiong who would wait patiently outside a train station for his owner to come home from work. In Japan, Hachiko the Akita became famous in the 1920s for meeting his master every day at a railway station. He continued to make the journey nine years after his owner's death.